The short-billed minivet (Pericrocotus brevirostris) belongs to the family of cuckooshrikes and minivets, the Campephagidae. The short-billed minivet species is distributed in India, Nepal, Bhutan, Bangladesh, Myanmar, Thailand, Cambodia, Laos, Vietnam and China. 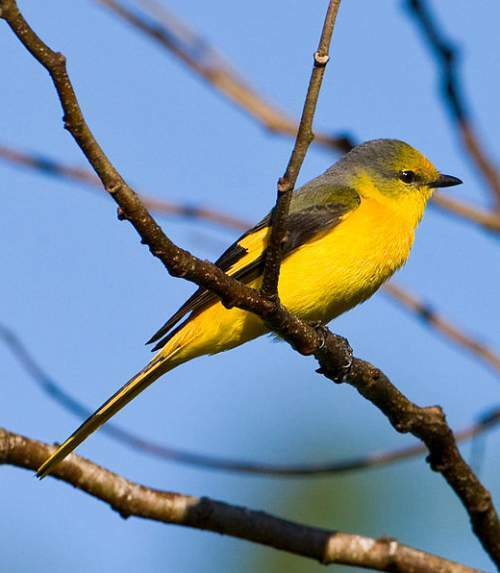 These minivet species inhabit open deciduous and evergreen forests. These minivets are polytypic species. The short-billed minivet (Pericrocotus brevirostris) is a medium-sized minivet, measuring 19 to 20 cm in length and weighing 15 to 17 grams. These species are sexually dimorphic. The male nominate short-billed minivet has glossy bluish black head, face, nape, throat, upper breast, mantle and scapulars. The back, rump and uppertail-coverts are deep crimson. There is slash of red on the wings. The female has golden yellow forehead. The crown, ear coverts and mantle are grayish yellow. The throat, breast and underparts are bright yellow. The dark gray wings have yellow patch. The juveniles have duller plumage. The bill is short, straight and black in color. The irises are blackish in males and deep brown in females. The eye ring is black in males and pale yellow in females. The legs are blackish. The call of these minivet species is a high pitched, loud, whistling "tsuuuit” sound. These short-billed minivets are distributed in India, Nepal, Bhutan, Bangladesh, Myanmar, Thailand, Cambodia, Laos, Vietnam and China. 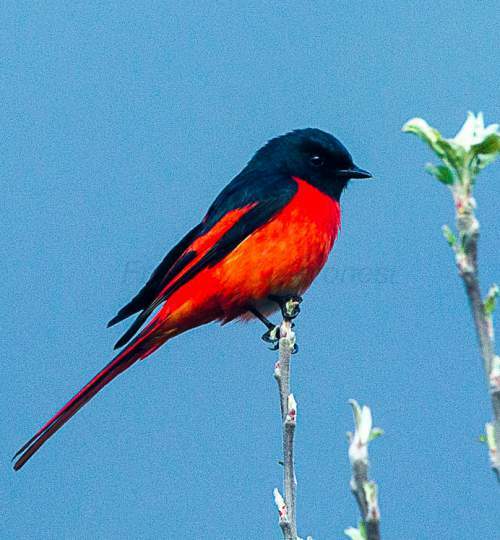 The short-billed minivet nominate subspecies P. b. brevirostris is distributed in central and eastern Himalayas in Nepal and northeast India, west Assam (India) and south China (Tibet, southeast Xizang and northwest Yunnan provinces). The short-billed minivet subspecies P. b. anthoides is distributed in north and central Laos, northern Vietnam and southeast Yunnan, Guizhou, Guangxi and northern Guangdong provinces in southern China. The short-billed minivet subspecies P. b. affinis is distributed in northeast India, north Myanmar and southern China (Sichuan, Yunnan). The subspecies P. b. neglectus is distributed in southeast Myanmar and northwest Thailand. The Important Bird and Biodiversity Areas (IBA) of these short-billed minivet species in Laos are, Phou Ahyon, Nam Xam, Nam Ha, Nam Et, Nakai-Nam Theun, Dong Ampham and Eastern Bolikhamxay Mountains. The IBA of these short-billed minivet species in Nepal are, Makalu Barun National Park, Annapurna Conservation Area, Mai Valley forests, Bardia National Park, Langtang National Park, Kanchenjungha Conservation Area and Dang Deukhuri foothill forests. 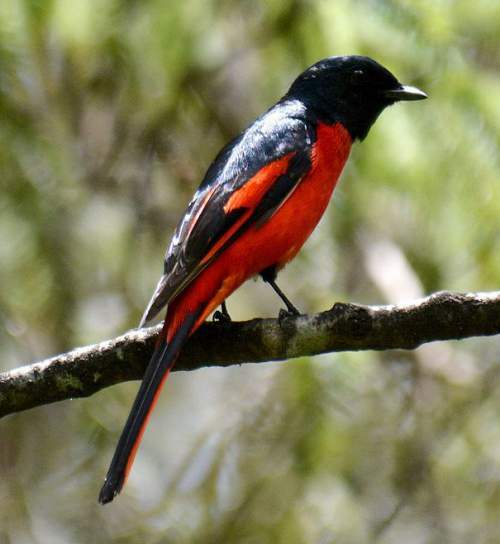 These short-billed minivet species have moderate forest dependence. They normally occur in altitudes from 1000 to 2700 meters. The artificial ecosystems and habitats of these minivet species include heavily degraded tropical and subtropical forests. The natural ecosystems and habitats of these minivet species include tropical and subtropical dry forests, tropical and subtropical moist montane forests and moist lowland forests. The diet of these short-billed minivet species consists mainly of insects. Insects, insect larvae and plant material like buds are their primary food. They forage among foliage, joining mixed-species foraging flocks. The breeding season of these short-billed minivets is during March and April in most of their range. These species are monogamous. They nest on horizontal outer branches of trees, about ten meters above the ground. Their nest is a cup-like structure built with moss and lichen. The typical clutch contains three eggs. These short-billed minivet species are non-migratory resident birds. They disperse locally after breeding. The populations in higher altitudes descent to lower levels during winter. The global population size of the short-billed minivet (Pericrocotus brevirostris) has not been quantified. The overall population trend of the species is considered to be stable. In most of its range, this species is reported to be fairly common to locally common. The generation length is not known. Its distribution size is about 3,360,000 sq.km. Habitat alteration and destruction, deforestation, human intrusions and disturbance and trapping adult and juveniles for pet-trade are the main threats that are endangering the survival of these minivet species. The short-billed minivet (Pericrocotus brevirostris) does not approach the thresholds for being Vulnerable, either under the range size criterion, or under the population trend criterion or under the population size criterion. The CITES (Convention on International Trade in Endangered Species of Wild Fauna and Flora) status is ‘Not Evaluated’ for the short-billed minivet (Pericrocotus brevirostris). The short-billed minivet (Pericrocotus brevirostris) is closely related to the long-tailed minivet (Pericrocotus ethologus) and the Sunda minivet (Pericrocotus miniatus). The four recognized subspecies of the short-billed minivet (Pericrocotus brevirostris) are: P. b. brevirostris (Vigors, 1831), P. b. anthoides Stresemann, 1923, P. b. neglectus A. O. Hume, 1877 and P. b. affinis (McClelland, 1840). Current topic in Birds of India: Short-billed minivet - Pericrocotus brevirostris.